Is there really any doubt the Mac App Store will be anything other than a huge hit when it debuts in 90 days? Seven billion downloads on the current App Store would suggest that Apple knows what it’s doing (and that people really love to slingshot cartoon birds into buildings). And the benefits of the App Store are clear: it’s an easy-to-use, one-stop source of safe, tested software. Usually. Maybe not all of that software is worth your time—how many fart Apps do you really need?—but the platform itself is sound, and Apple is keen to make sure it stays that way. But the platform is closed. Only with Apple’s approval (not to mention its 30 percent cut of the action) can your App find a home on the App Store. But is that scenario ideal when it comes to desktop operating systems? When Apple rolls out the Mac App Store in three months’ time, it will have created a new “class” of Mac software: Apple-approved and App Store-certified. All of a sudden software that isn’t from the Mac App Store looks a little less… official. New Mac users—and there’s sure to be plenty given Apple’s year-on-year growth—will be trained from Day One to look to the Mac App Store for software. What happens to software developers who, for whatever reason, don’t want to be a part of the Mac App Store? 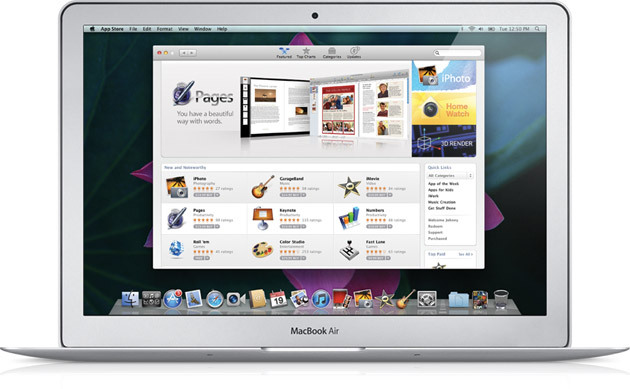 Why would a new Mac user visit third-party sites like MacUpdate or VersionTracker to find software when they know they can always pull up the Mac App Store to find Apple-approved, App Store-certified software? You can also be sure that Apple will leverage the Mac App Store to sell its own software, further boosting the status of all software found on the Mac App Store. During yesterday’s demonstration, Apple showed how easy it is to buy, download, and install Pages, the word processor component of its iWork suite, using the Mac App Store. (Not showed, of course, is just how easy it is to download and install software using the decade old apt-get system, but let’s leave that alone for the moment. Steam also says hi, perhaps gritting its teeth a little bit.) What Mac user is going to go out of his or her way to find and download software when they can just as easily pop up the Mac App Store—safe, tested, secure—and browse away from there? And perhaps bordering on the conspiratorial, why would you want Apple granting or denying its seal of approval on the software you run on your computer? I thought these were called personal computers? Who’s to say, somewhere down the line, that Apple doesn’t decide that the Mac App Store is the only place where new software can be acquired? For your safety, dear Mac user, we’ve eliminated the ability to launch .app bundles not delivered by the Mac App Store. We hope you understand that this is being done with your best interests in mind. Thank you for choosing Apple. Do I expect that to ever happen? Obviously not—that’s ridiculous, even for Apple—but let’s not pretend that’s not exactly what happens on the iPhone and iPad. How many times has Apple warned us not to jailbreak our iDevices, citing security and stability concerns, not once mentioning that jailbreaking is the only way to install “unapproved” software? My concern, I suppose, is that an over-reliance on, and an over-veneration of, the Mac App Store could lead to an unnecessary, if not dangerous, homogenization of Mac software. Again, to expect that the Mac App Store won’t be anything other than a smashing success is pure folly, but let’s at least be cognizant of just how dramatic a shift the Store may well represent.